Preface: The Evolution of Arthritis Treatment in the Foot and Ankle: A Change in the Gold Standard? 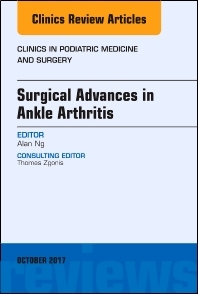 This issue of Clinics in Podiatric Medicine and Surgery, edited by Dr. Alan Ng, will cover Surgical Advances in Ankle Arthritis. Topics discussed in the article include, but are not limited to Conservative Treatments, Ankle Arthrodiastsis; Ankle Arthroscopy; Supramalleolar Osteotomies; Ankle OCD Repair; Innovative Techniques for Ankle OCD Repair; Open Ankle Arthrodesis; Arthroscopic Ankle Arthrodesis; Total Ankle Arthroplasty; and Surgical Complications of Ankle Joint Arthrodesis and Arthroplasty Procedures.